Huh. I get no comments on the picture of my underwear waving over the streets of Venice like little flags announcing the arrival of a king. Pity. 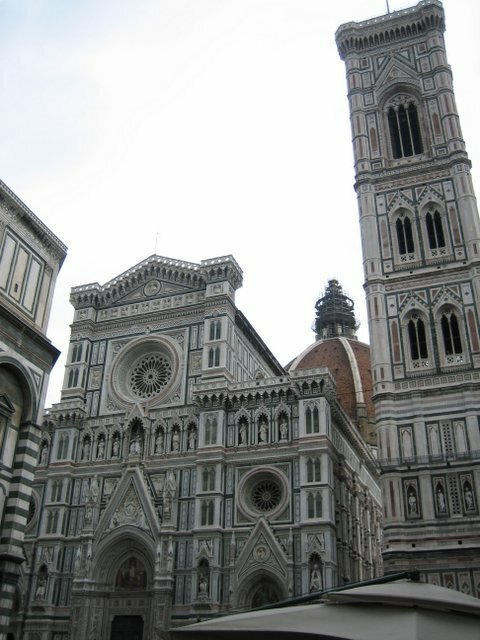 We followed Anniina’s sight-seeing suggestions pretty much to the letter, beginning with the Duomo and ending with the Palazzo Pitti. 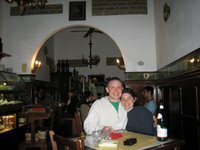 We even went so far as to have dinner at Sasso di Dante. I don’t remember if she said we should drink a little too much wine with dinner, but we did regardless, and that always makes the night end well. The “Sasso di Dante” is a cozy little restaurant situated in a corner of the Piazza del Duomo (the square of the Cathedral). The manager stayed behind the cashwrap at the front of the restaurant making appetizers comprised of rocket, proscuitto and salami, pouring wine (one for the customer”¦one for him), answering the phone and greeting guests. The one waitress zipped around the two-room restaurant in an efficient fashion uncharacteristic of European restaurants. We had a lovely time. Annina said that “the restaurant was built on the spot where Dante used to sit on a tree stump, gazing at the construction of the cathedral, while writing his Divine Commedia.” I know that he couldn’t have written it after the construction of the restaurant; he would have been too full to write. Terrific food, better wine, and an intoxicating atmosphere. It was a good night. On the way home I had a sudden and uncontrollable gelato-deficiency attack, so we immediately found the first gelateria and bought me a cone of tiramisu. The gelato-scooper-lady handed me my change, and when I reached for it I accidentally hit her hand which sent my change up into the air and down into the bins of gelato. All three of us stared at the precarious Euros, floating atop the creamy gelato. The lady laughed, scooped them out, washed them off under the sink, plunked them in my hand, said “Grazie, bueno sera” and sent us on our way. I just realized that I started this post at the end of the day”¦that won’t do. As I said earlier, the first thing we visited was the “Cattedrale di Santa Maria del Fiore.” It’s a grand Cathedral with meticulously ornate walls and a fresco painted on the inside of the dome by Giorgio Vasari and Federico Zucchero depicting the Last Judgment. 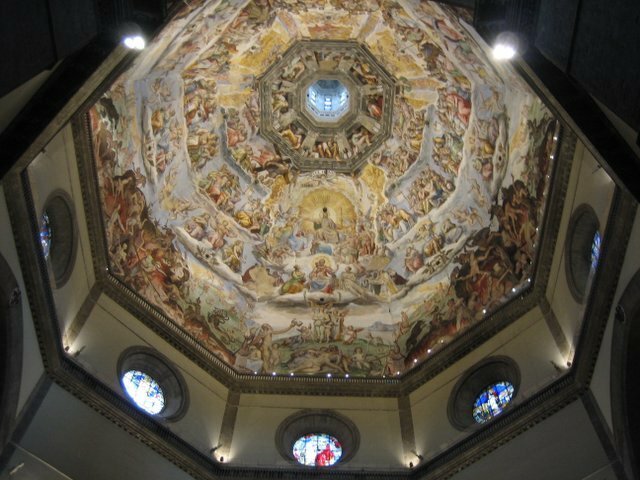 You stand beneath it staring straight up, all the while allowing the beauty of the fresco to wash over you, and after a time you eventually begin to realize you’ve gone and gotten a bad crick in your neck from staring straight up for far too long. Bit of a conundrum: Stare straight up and get a neck-ache, or don’t look at the fresco and don’t get a neck-ache. I chose neck-ache. 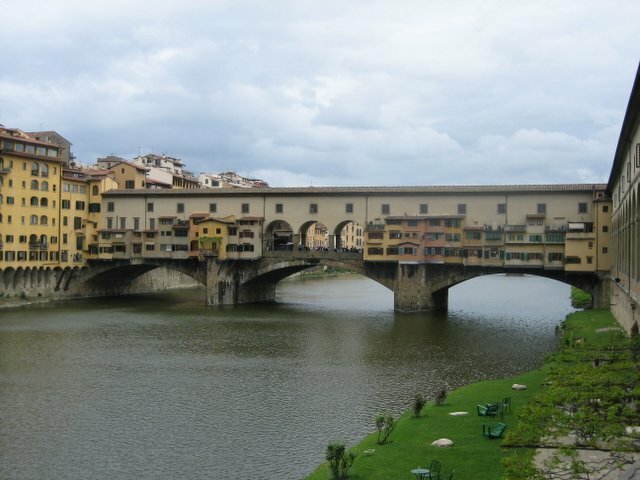 We also saw the “Ponte Vecchio.” Those buildings on the bridge are shops. People were taking pictures, shopping, and eating gelato all on the surface of the bridge. It was a surreal experience. I should also add that I did almost get into a fist-fight with some jackass on the bridge that got all indignant after he bumped into me and his camera bag fell off his shoulder, but I didn’t let that ruin my time. 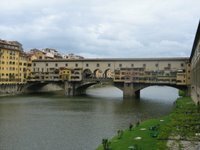 In fact, I would have loved to have thrown some cocksure nitwit off the bridge and into the frigid waters of the Arno below. I would have considered that a trip-bonus. 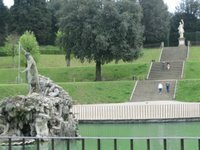 Toward the end of the sight-seeing portion of our day we visited the “Giardino di Boboli,” or the Boboli gardens. 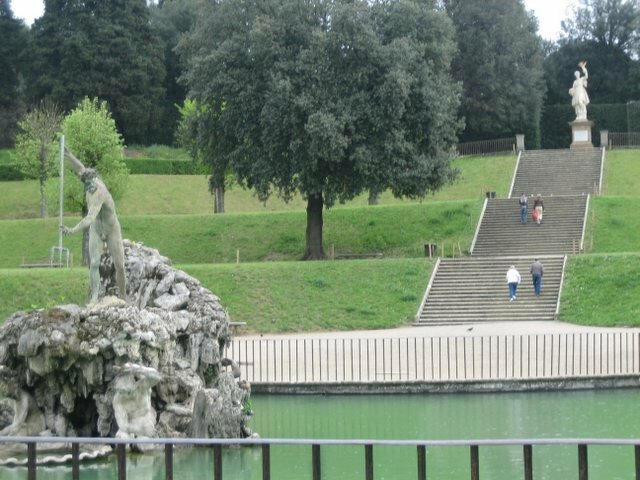 Now, when Anniina said to visit the gardens she didn’t explain that the gardens are 11 acres large, and portions of them reside atop a hill steeper than the curve I needed to help me pass physics. Once we reached the top I realized I needed a Tiger-Companion and a Radio Flyer wagon for the trip back down. In all seriousness, the garden was absolutely beautiful, and truthfully I would have loved the opportunity to jog the trails hidden just beyond the official paths. This will mean something to exactly two people, Leigh being one of them, but the slopes on parts of this garden make “Lock’em Ups” look like “River Trail,” and there were some gnarly switchbacks as well. Some of them were even cobbled, which would insure that I would slip and fall into the bushes or roll down the hill. I can just imagine the fun. 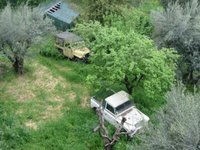 We did see one weird thing at the top of the Boboli gardens: several dead Land Rovers and Jeeps rusting away just beyond the walls. We had to lean way over the side of the wall to see them and take this picture. I don’t know why I found them so interesting, but I did. They seemed rather melancholy and sad. I like to imagine they went on many exciting adventures down dusty roads and fording through piranha infested waters during their time”¦maybe to places like Africa and Australia and Thailand and the Amazon”¦before being abandoned and left to rust away into dust at the foot of the wall of the Boboli gardens. I just realized that I’ve damn near written two single-spaced pages for one post. That’s just too much, so I’m ending now. Thank you and congratulations if you waded through my nonsense. I’ve got some interesting things to say about languages and cars that I’d like to share, but that’ll wait for a lighter posting day. I’m adding pictures to my flickr photostream, and you’ll get a link dump tomorrow. Your directions and recommendations were wonderful. Thank you again for those terrific posts. Next time you’re in Florence you should try Da Ganino on Via D. Alighieri. We ate there tonight and it was divine. Gelato, gelato, gelato. It’s like manna from Heaven. If we weren’t walking a zillion miles everyday I’d be scared I would come back to the states with an enormous gut. Da Ganino – writing it down in my guidebook. What did you eat there? I’m awful, aren’t I, but descriptions of food give me a thrill, LOL! AHA! My guidebook mentions it, so I’m circling it and writing “Mark recommends” next to it. I had the Florentine steak, which our guidebook said was topnotch, and they were right. It was simple but very good. And Leigh had grilled pork chops and fried potatoes. It was really good.